If you’re coming to India you’ve probably already tried Indian food many times. 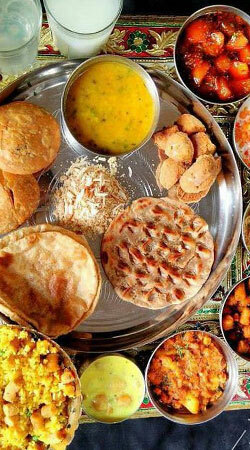 In fact, Indian food is so common around the world that the so-called national dish of the UK is a curry! Our advise is, set aside your preconceptions about Indian food and be prepared to be wonderfully and joyously surprised over and over again by the delights of food in India. Generally speaking, the vast majority of Indian restaurants in western countries serve food which is representative of the Punjab region in the northwest. The common explanation for this is that during the imperialist era, the British rulers of India preferred to employ chefs from the Punjab and it was that style of cooking which dominated when the British took ‘Indian’ food back to the west. Whatever the actual reason, and as wonderful as Punjabi-style cooking undoubtedly is, the regional cuisines of the rest of India are far more varied than you can possibly image. Spices- particularly pepper and cardamom- dominate in the south, and it’s generally accepted that the hottest/spiciest food of all comes from the southern state of Andhra Pradesh, where, not happy with merely using lots of pepper they love to add an extra kick with lashings of chili as well. Elsewhere in the south, Tamil food, which you’ll inevitably hear described as being ‘not just food, but medicine’ is primarily plant-based (indeed India is a paradise for vegetarians as huge numbers of people don’t eat meat at all) and utterly delicious. A typical meal will consist of rice, or a rice-derived item like idli or dosa, and several vegetable dishes and gravies. A meal shared with Tamil people may upend everything you think you know about food and nutrition. And taste- this is truly some of the most delicious food anywhere. And no, it’s not all spicy! In Kerala, coconut dominates, whether in the form of oil, flakes or as a flavouring. The diet here has a much higher meat content, particularly fish. Further north, Rajasthani food tends to be simple and flavoured with different spices- more chili- than the south and with the use of lots of pulses and grains. Street food is an absolute delight and, provided you are sensible and follow the advise of your driver or a specialist tour guide, absolutely safe. Sweet items tend to be intensely sweet and served more as morsels than like a traditional western-style dessert plate or pudding. Delicious but dangerous would be a good way of summing up Indian sweets. We’ve been saying for years that the majority of ‘complaints’ we get about food during our clients’ travels to India are related to eating too much and people putting on weight while they are here- truer now that ever before!